Investment and commodities guru Jim Rogers says we’re heading toward the worst bear market in his lifetime. Rogers recently spoke a the MoneyShow in San Francisco. He said the first thing we need to understand is that in the wake of the 2008 financial crisis, the Federal Reserve “came to the rescue” and drove interest rates to the lowest level in recorded history. But Rogers said he knows how it’s going to wind up. Roger’s emphasized that we have always had bear markets and we’re on the cusp of another one. 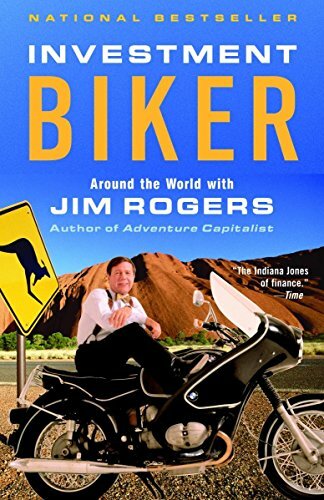 Investment Biker: Arou... Jim Rogers Best Price: $1.50 Buy New $10.50 (as of 03:15 EDT - Details) Rogers noted that the last bear market was caused by too much debt. Well, today we have even more debt. In fact, the world is drowning in debt. The Fed’s balance sheet has gone up over 500% over the last decade. Over the last 30 years, the US went from being a creditor nation to the largest debtor nation in the world. No wonder Rogers isn’t optimistic about the bull market running on forever. Rogers talked a little about the US dollar saying he holds a lot of greenbacks right now, but not because it’s a strong currency. In fact, he said he thinks we may well see a dollar bubble as investors turn to it as a “safe-haven.” But it’s not really a safe haven. Again, the US is the largest debtor nation in the history of the world. And as we all know, eventually, bubbles pop.